A virtual postcard to you from Saturday morning at the John Friend workshop in Miami. Enjoy! The rest of the weekend was, of course, fabulous. As always, it takes me a little while to download all that I learned into a manageable format to then share it on the blog and with my students. So stay tuned for lots of juicy nuggets from the weekend. And i'm wishing lots of love, stamina, and success to those gathered in Miami now for the advanced intensive. They're gonna need it! Whew! A brief little post while I'm on a mini-vacation in Florida to visit with my in-laws and catch a workshop with John Friend. It's a little odd to be both on vacation and about to go to "work" (a yoga workshop). I'm planning to attend just the workshop portion of John's stay in Miami for the Dancing with the Divine 2011 tour. It's exciting to get to practice with John again after just seeing him in November. It's a little daunting too after the dregs of wintertime. I'm certainly not where I'd like to be in my practice to be workshopping with him. (dang holidays and cold weather!) But either way I want to just enjoy my time and relax as much as possible so that I can take in all he has to offer. And no matter how it goes, it is still super nice to be warm for a few days. Ah. Sunshine. Sweet! Yeah, that's me with my new BFF, Amy Ippoliti, you know, the Januaray 2011 Yoga Journal cover model. We're tight. Ok, well, sort-of. All this month I've been participating in Amy's amazing online course 90 Minutes to Change the World. It is a webinar (so cool) designed to bring up the level of teaching in 90 minute local public classes. She created the webinar because she was finding so many people are trying to go right from teacher training into becoming national and international teachers and it seems that the local teacher is losing ground. 90 minute local classes are really where it's at for building yoga communities in our hometowns and if the local teachers aren't at the highest level then the community really misses out. And you know, if the yoga community isn't as strong as it can possibly be then the greater local community isn't going to be as strong as it can possibly be. Because the way I see it, yoga changes the world. The webinar is set up in two sessions weekly for 4 weeks. The Tuesday session is for Amy to teach and give information, the Thursday session is for coaching. Students send in questions and Amy chats with you right online or by phone with everyone else listening. (it's ok if you're not available for the call, you can listen to the recordings later). This is how Amy and I got to be best friends. Last week I submitted a coaching request and didn't think I'd even be free for the call, but I was online and then suddenly Amy says she's going to answer my question. So she un-muted me and we chatted online for a few minutes. It was totally cool! Here is this world traveling, very well respected and influential Certified Anusara Yoga teacher having a conversation with me, just me, about one way to improve my teaching skills. I felt so special and so cool. The experience hit home for me just how important individual attention is for each student. (Funny thing is, that is what my question was about, how to effectively give attention while teaching). But I could easily remain an anonymous listener in this whole webinar. Invisible essentially, But by asking my question and being open to having it answered, I didn't end up hiding away. Instead, I was "Seen" by Amy and have a connection to her, my teacher, and to the rest of the group. It was extremely fun, inspiring and powerful. And it reminds me again that the personal individual connection is what is going to make a huge difference for my students. If they trust me and believe I have their best interests at heart, they'll try anything. The power of the relationship! Contemplation/Question: How do you connect individually with your students or teacher, clients, employees etc? Or, just with your family and friends? What a gift I had this weekend to be able to open my heart in two different workshops.... first as a student and next as the teacher. The first workshop was on Saturday with the Shakti-filled Lila Pierce Brown of Gateway Yoga in Raleigh, NC. She was in my hometown, in a studio that is at most a mile from my parents' house. I could not resist being there with her. She led a two hour backbending practice which was super fun and empowering. It was even more fun to party alongside my mom and to get to partner with her. Yay Mom! After the backbending she offered 3 hours of Hands on Adjusting for Teachers. That one was even better for me because it allowed me to brush up on the skills I learned in YTT but don't use nearly often enough. AND I learned some new adjustments to add to my repertoire. Lila was so welcoming, loving, attentive, and energetic. She is a total light and joy to workshop with. If you are ever in the Raleigh, NC area do check her out, she is well well worth it. On Sunday, after my morning class I taught a 3 hour backbending workshop myself. I'd be remiss if I didn't give credit to Lila for inspiration for some of the poses and even for some inspiration on the theme, but that's how yoga works right? We pass it from one to another, each putting his or her own spin on it. My friend says that it becomes like a twice baked potato that way. And I agree and am not bothered at all by that idea. The workshop turned out to be a more intimate group than my first one. Eight folks showed up and they ranged from experienced teachers to folks who never get off the ground in Urdhva Dhanurasana. By the end everyone had made some progress. One who never had done UD before was popping up there like she'd been doing it all her life. Another who also never did UD struggled a bit more, but was making progress, getting her head off the ground and was SO incredibly open, I was humbled to watch her efforts. The privilege of being the yoga teacher is being able to watch the beauty of these unfolding souls as they take new steps forward on the mat. So whether the room was filled or not, I had an incredible experience and I think the students did too. Either way, I know hearts were open and visions expanded. We all floated out of there with big grins, and that's what it's all about in the big picture, right? After the craziness of the weekend, I came home and ATE! and then yesterday spent the day recouping with a long hip opening/forward folding practice and plenty of Savasana. Whew. Meditation has never particularly been my strong suit on the 8-limbed path. I've had a haphazard practice since I workshoped with Cyndi Lee in 2007. I'd sit for an inconsistent amount of time every few days, I'd miss a week or two, or would just not particularly be interested in trying it. In the last year I've had more fits and starts with it. Small pockets of longer timings and then days or weeks off. Sitting was never as important or protected in my day as my asana practice. I had the interest, but never much instruction in what to do... and therefore nothing much ever happened when I sat. Then, a few months ago, you may remember I took a little bloggy break because my daughter needed my attention during naptime and, seemingly, at all times. It turned out that the only freetime I had for any sort of spiritual practice was in the early morning hours before she awoke or after she went to bed. Well, after bed time was too late for any contemplation, but during those intense weeks I took my tush to my cushion every morning religiously. 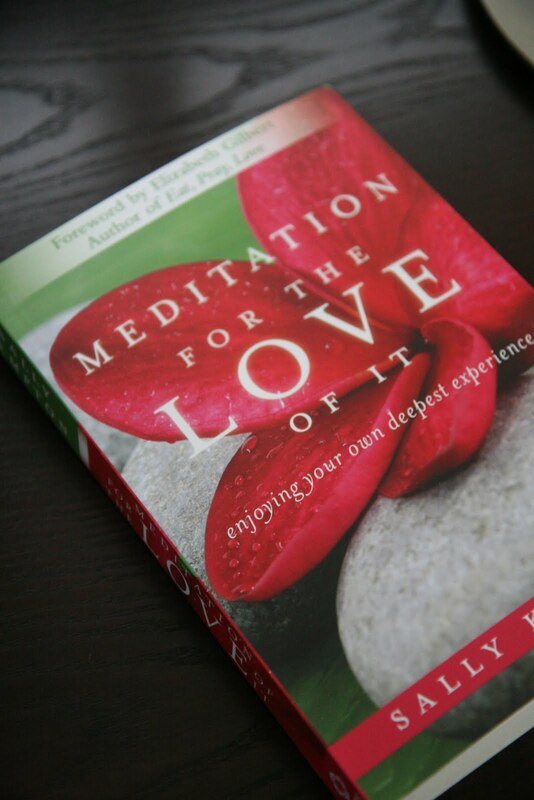 Well, just in time for my little Meditation Awakening, Sally Kempton has a new book out called Meditation for the Love of It: enjoying your own deepest experience. Um. Phenomenal, Transformative, Awakening, Enlightening, Magical. Simply put, this book is Awesome! Literally from the moment I read the first chapter my meditation practice was transformed. No longer sitting just to sit, in the very first chapter Sally Kempton asks what do you want from your practice? and simply by asking for more, I experienced more. It's like my practice was waiting all this time to reveal itself to me. What is even more exciting about this book for meditation instruction is that Sally Kempton is knowledgeable in Tantra and specifically Kashmir Shaivism -- the very systems that Anusara aligns with. So not only am I deepening my experience of my heart and the Divine in meditation, I'm doing so with the guidance of a scholar in my very system. Her instructions and insight bring home much of what I've already learned in yoga classes and training. The book has chapters on what to expect in a meditation session, how to optimally get started and finish each session, tools for entering into a meditative state, what to do to work with the mind and all it has to "say", how to work with Shakti/Kundalini energy, a 3 week jump start for starting a new practice, and finally Q & A for some of the common questions that accompany meditation. Each chapter is filled with so much information, but it is presented in an easy to read and inspirational conversational style that made me want to get on the cushion again and again. This is a highly highly highly recommended read for anyone but especially yogis on the Anusara path who want to deepen or start a meditation practice. Check it out and let me know what you think. Contemplation: What do you want from your meditation practice?